Located in beautiful Anderson, South Carolina. Anderson Motor Speedway is one of the most spectacular displays of motorsports in the Southeastern United States. 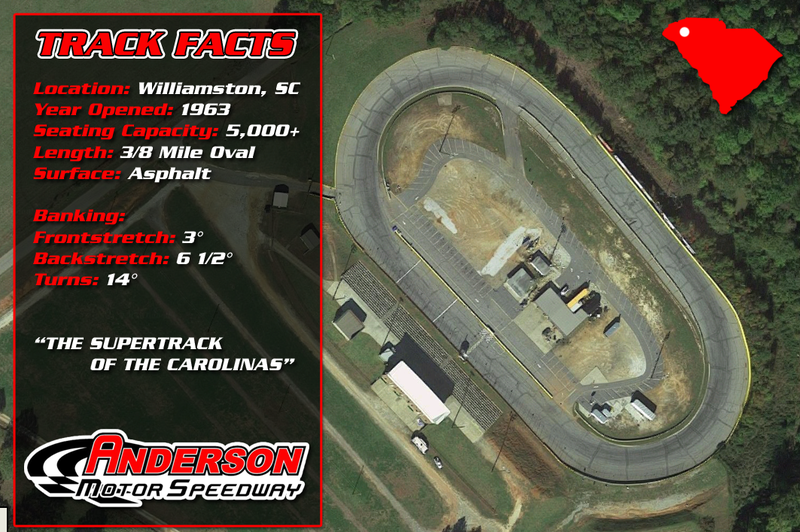 Anderson Motor Speedway’s wide straight-aways and tight, tricky corners are infamous for producing close, competitive short track racing each and every weekend. Anderson Motor Speedway roars into action each Friday night throughout the summer. A full lineup of the best driving talent from across the Carolinas and Georgia invade the “Supertrack of the Carolinas” each week in the quest for the checkered flag. Anderson Motor Speedway showcases some of the fiercest competition around.